We at KiiLN are thrilled to announce that the Small Business Administration (SBA) has once again recognized our efforts as an accelerator for biotech startups. The SBA selected us as one of 20 winners in the 2017 Growth Accelerator Fund Competition after a two-round review process which included a video pitch. The detailed announcement is available here. Congratulations to our fellow winners and a huge thank-you to the SBA for supporting this network of accelerators that are building the businesses of the future! We are happy to announce that KiiLN has joined the Business Incubator Association of New York State (BIANYS). This is an extraordinary opportunity to build our network outside of the NYC. BIA/NYS has been a long time supporter of entrepreneurship. The Executive Director, David Hochman has testified before State and City legislature, in support of a renewed/continued commitment to entrepreneurship as a means to drive economic development. At KiiLN we firmly believe in this premise and we are happy to be part of a group of like-minded individuals. We would also like to thank BIA/NYS for bringing incubators from different industries and regions together. We look forwards to learning, sharing and growing with our peers. Originally published on here on September 8th 2015. Re-published with permission from author. Less than a month ago Nicole McKnight (one of five female co-founders of the biotech accelerator, KiiLN) and I made our way from the Upper East Side of Manhattan to the Bronx as Nicole was invited to moderate a panel entitled, ‘Capital Formation Pathways for Small Businesses’. The Assembly Member for the 79th District, Michael A. Blake and the Bronx Borough President, Ruben Diaz Jr. hosted the Small Business Association (SBA) and the US Securities and Exchange Commission (SEC). It was one of those hot NYC summer days where the one dollar helados being sold from the carts was indeed tempting but we opted to forgo, what was sure to be rainbow colored (flavored) lipgloss until the event was completed. We made our way past the Yankee’s Stadium, to Boricua College. I think it is blog-worthy to emphasize the event’s location, as it was atypical. It also speaks to a growing interest in entrepreneurship. From the window of the seminar room we could see the strong-boned and beautiful Mario Merola Building (formerly known as the Bronx County Courthouse). Assemblyman Michael Blake wastes no time in pointing out that it is a prime location for an incubator. This announcement set the general tone for the meeting, one of hopefulness that innovation and entrepreneurship will help lift this community up and provide opportunities for the residents of the South Bronx. Most interesting though, was the diversity in the backgrounds of those in attendance. Present was a team of app developers, based in a Bronx incubator space. There were also entrepreneurs in attendance with a host of unique ideas ranging from a beverage business to a doll’s clothing company. Everyone introduced themselves and shared a bit about their dreams and ambitions with the group. This exercise really helped to establish that everyone present had ideas — ideas that they wanted brought to life. As the event proceeded, Sabastian Gomez of the SEC give a quick crash course on the various funding mechanisms for new businesses, while his colleagues emphasized the SEC’s dedication to promoting diversity in business entrepeneurs. Then there was a brief exploration of the idea of a company’s value in the form of equity. This led into the hot topic of Crowdfunding as a promising path to funding one’s business. Mr. Javier Saade of the SBA emphasized the important role that Crowdfunding could play in presenting traditionally underrepresented founders and entrepreneurs with a valuable route to raise capital. As the details of the JOBS Act become finalized, the potential for impact from legislation that essentially enables Crowdfunding to be used more widely as a platform for fundraising is immense. The one request made by the members of the audience was for the information to be easily accessible and digestible. I couldn’t agree more — let’s give all good ideas from good people the best chance for success. Keisha is a biochemist with a commitment to helping good scientific ideas reach the public. She believes that there is innovation potential at the intersection of finance, technology and science. In addition to her entrepreneurial interests, she enjoys eating tasty food from different cultures and spending time with her dog and husband. Crain’s Health Pulse article talks about KiiLN’s progress in the biotech arena. 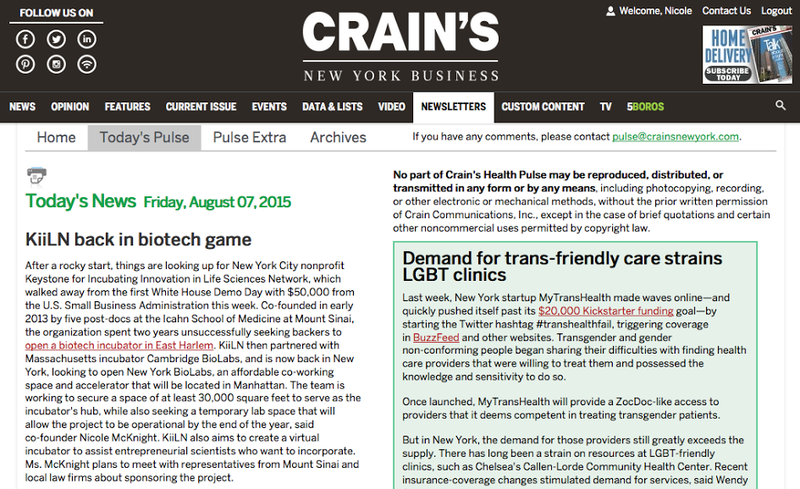 Crain’s New York Business’ Health Pulse reports on KiiLN winning the Small Business Administration fund. See here for details. 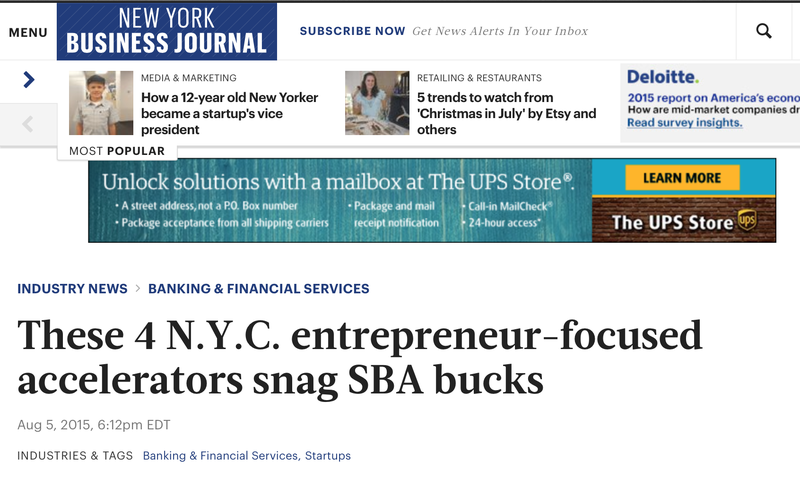 Check out the New York Business Journal spotlight on the four NYC winners of the Growth Accelerator Competition from the Small Business Administration. Read more here. New York City, NY. August 4th, 2015: KiiLN has been selected a winner among hundreds of entries for this year’s Growth Accelerator Fund Competition, awarded by the US Small Business Administration (SBA). The awards were announced on August 4th, 2015 at the first-ever White House Demo Day. President Barack Obama hosted this event to highlight the contributions made by innovators to the nation’s economy, with a focus on inclusive entrepreneurship. Check out this article about WCA’s BLUEPRINT Accelerator Network exploring a relationship with KiiLN- more here. One of the advantages of being a non-profit is working with the professional network from Catchafire. They feature here how they successfully matched us with a professional to develop our fundraising pitch deck. Check out the report by Irina Ivanova “Biotech Incubator Wants Startups” in today’s issue of Crain’s Health Pulse. We are excited to read the Einstein Journal of Biology and Medicine blog by Pablo Rougerie about NYC initiatives for biotech startups. Read the full article here.